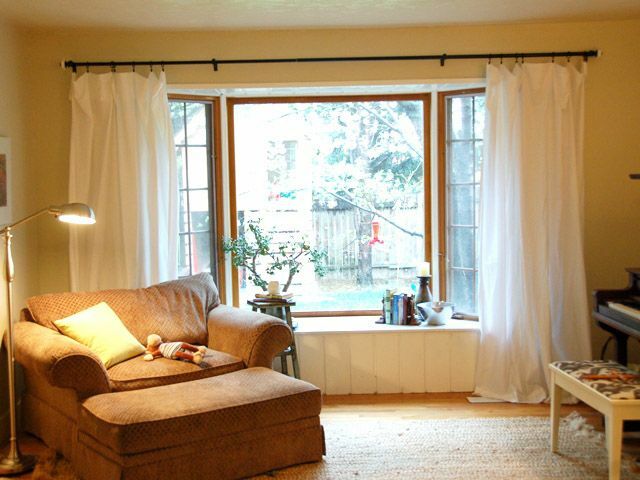 My sadly neglected front room ﻿needed a little bit of love, so I went out recently and bought it some curtains. But not really, because I didn't want to pay a lot for two 96" curtains in a room that has zero direction or cuteness happening. 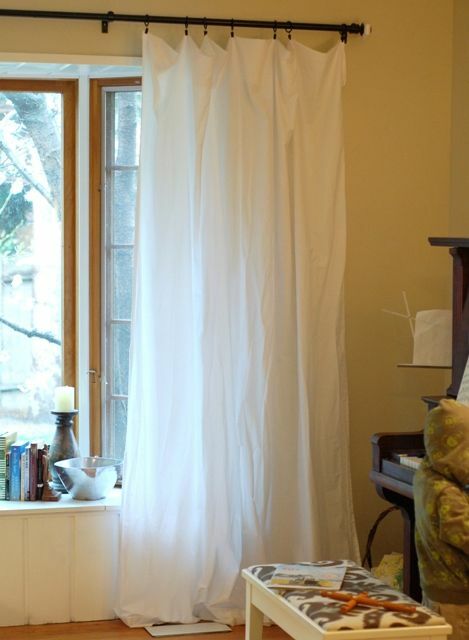 I'm not buying real curtains until I have a plan in place. I bought some sheets instead. I ventured into my local Walmart and discovered a rainbow of sheeting separates for very little money. I'm not usually a fan of that store, but I am a fan of good deals. And $5 for a twin-sized flat sheet is a good deal. 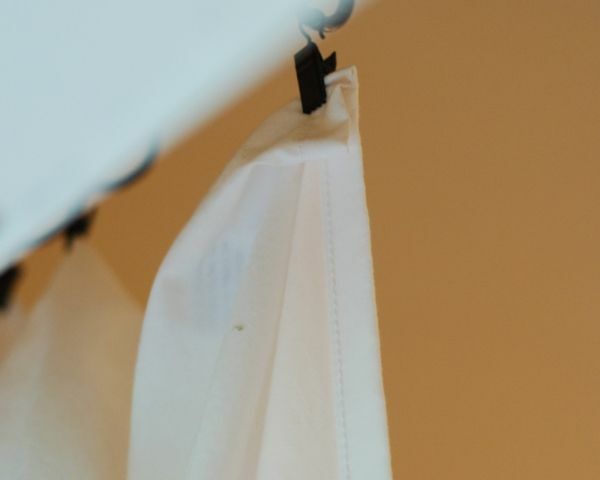 I bought two flat sheets, turned them upside down so the wide hem would brush the floor like a normal curtain's wide bottom hem, chose my desired length and folded the excess over on top, then added some curtain rings. If you didn't want to use rings you could just thread the pole through that wide hem, but then you might need to get rid of some of the extra length at the bottom then hem it, and that would take way too much effort for me. Pretty easy, right? Nobody's seen them and asked me if they were sheets, which I'm taking as a good sign. And for $10 the price can't be beat. They look so good! You really would never know they were sheets. And I love how they pool on the floor. Impressive! I am a fan of a good deal and especially ones that look like they cost a lot more! Way to go!!! HUH. Amazing...and something I will be doing for the guest room soon! Thanks! I like that idea! And then after you replace them you can use them for actual sheets. It's a no-waste win-win solution. Oh, I am liking this idea. Baby's room (it's not so much a 'nursery' as a 'room that contains crib and junk') is half blue/brown bedding and half pink/orange curtains left over from when the room belonged to his sister. He seems to like looking at them, but I wish the room was cuter. Until inspiration strikes, maybe I'll put some brown sheets up. Cheap, chic idea that I really like. Hope I can pull this off as well as you did. I've been trying to think up a way for cheap sheets! You've solved the mystery! Thanks! I have a light blue duvet cover with a quatrefoil thread pattern that I use as a curtain. It looks fancy since I rigged it up to move up with my mini blinds. I'm glad I'm not the only one doing this trick!